Dear Readers: This is the first of a multi-part series on the political science forecasts of the 2016 races for the White House and Congress. We’ll be featuring forecasts from nine different individuals and/or groups this year, which James E. Campbell is assembling as part of a project for PS: Political Science and Politics that we are also featuring in the Crystal Ball. These models are based on factors such as the state of the economy, polling, whether an incumbent president is running for reelection, and other indicators. They can often be a better predictor of the eventual results than polls alone, and many are finalized months before the election. We are pleased to feature Campbell’s work and the work of the many top political scientists who have built these models, both in an attempt to predict the outcome of the election and, more importantly, to identify the factors that actually affect presidential races. Following Campbell’s introductory essay are the first two of the nine models we’ll be including in this series. As we feature new models, we will update Table 1 to provide a running tally of these forecasts. Since 1996, a group of these forecasts have been published prior to the election, first in American Politics Quarterly and since 2004 in PS: Political Science and Politics (a publication of the American Political Science Association). This year, in addition to again publishing the forecasts in PS, we are delighted to join with the Crystal Ball in releasing each forecast as it becomes available. There are nine forecasters or teams of forecasters lined up to predict the national two-party popular vote for the major party presidential candidates. In some cases, they will offer more than one forecast based on new information as the campaign proceeds, but most forecasters offer a single forecast fixed in place for the election. In addition, several of the forecasters will be reporting their predictions of the aggregate results (net seat wins or losses) of this year’s Senate and House elections. Accompanying each forecast will be a thumbnail description of the model upon which it is based along with a link to the PS website and the article (when it becomes available) fully describing the details of the model. Predictors: Primary Score of Democratic Candidate, Primary Score of Republican Candidate, Democratic vote in last election (2012), and the Democratic vote in the next-to-last election (2008). The Forecast: Donald Trump 52.5%, Hillary Clinton 47.5%. Posted on March 7, 2016. Notes: Table will be updated as model results are released or updated with new information. James E. Campbell is a UB Distinguished Professor of Political Science at the University at Buffalo, SUNY. His previous books include The American Campaign and The Presidential Pulse of Congressional Elections. 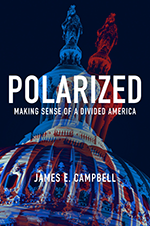 His latest book, Polarized: Making Sense of a Divided America, is forthcoming from Princeton University Press in July. 1. See James E. Campbell, The American Campaign: U.S. Presidential Campaigns and the National Vote (College Station, TX: Texas A&M University Press, 2008); Robert S. Erikson and Christopher Wlezien, The Timeline of Presidential Elections: How Campaigns Do (and Do Not) Matter (Chicago: University of Chicago Press, 2012). 2. Christopher Wlezien and Robert S. Erikson, “Temporal Horizons and Presidential Election Forecasts,” American Politics Quarterly 24 (1996): 492–505; Christopher Wlezien and Robert S. Erikson, “The Timeline of Presidential Election Campaigns,” Journal of Politics 64 (2002): 969–93; Christopher Wlezien and Robert S. Erikson, “The Fundamentals, the Polls, and the Presidential Vote,” PS: Political Science and Politics 37 (2004): 747–51; Robert S. Erikson and Christopher Wlezien, “Leading Economic Indicators, the Polls, and the Presidential Vote,” PS: Political Science and Politics 41 (2008): 703–07; Erikson, Robert S., and Christopher Wlezien, “The Objective and Subjective Economy and the Presidential Vote,” PS: Political Science and Politics 45 (2012): 620–624.